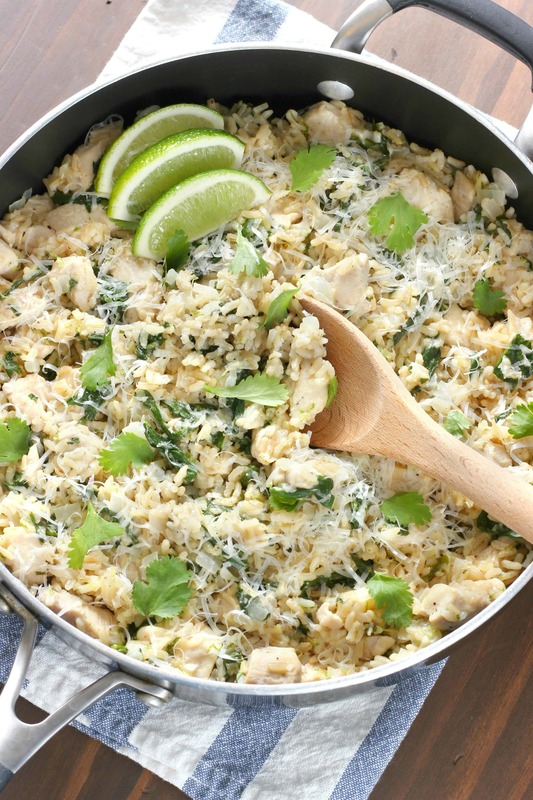 This Cilantro Lime Chicken with Rice Skillet is fresh, flavorful, and ready in 30 minutes! This week marks the official start of spring. That means warm weather and sun is coming! However, it won’t be around to stay for awhile here in Minnesota. Even though it was in the 50’s yesterday, it’s only supposed to get in the 30’s today. That’s MN weather for you. So, while we look forward to warmer weather and all of the fresh produce that will come with it, we’re still looking for comfort food on these chilly evenings. 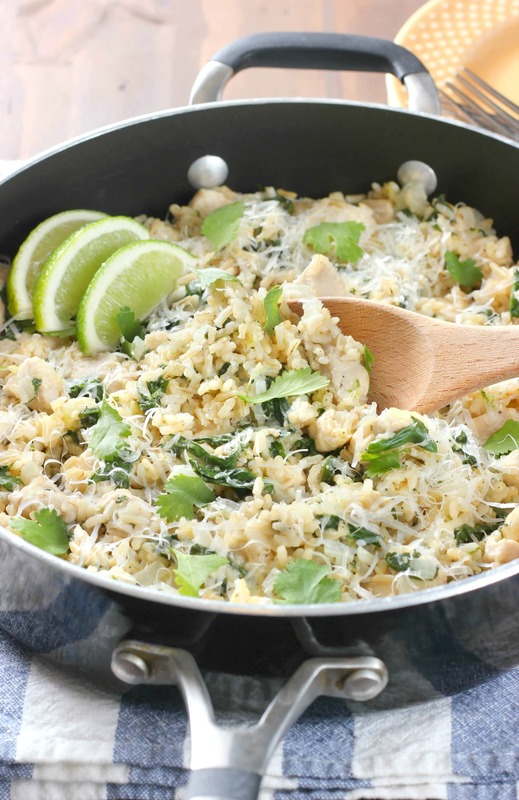 Like this cilantro lime chicken with rice skillet. Not only is it super easy and full of fresh flavor, but this skillet meal is also hearty and healthy. Think of it as spring comfort food! And with this skillet meal, you can cook it right up in the same dish as everything else. The fewer the dishes the better in my book! 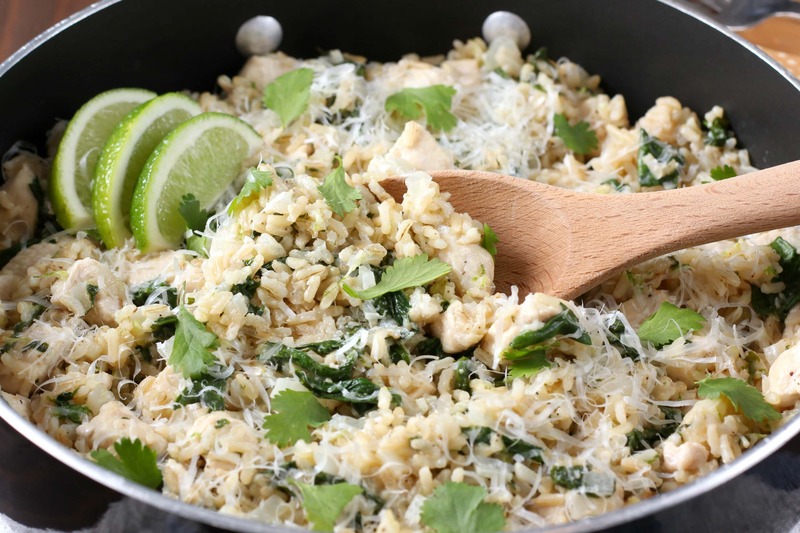 Cook some chicken, stir in the liquid and rice, and then add in a hearty serving of spinach, parmesan, cilantro, and fresh lime zest! That’s all it takes to get this skillet meal on the table. Then you can sit down and enjoy some hearty, spring comfort food! In a large skillet, saute chicken, onion, and garlic in olive oil over medium heat until chicken is lightly browned, about 5 minutes. Stir in cornstarch and cook for 1 minute. Carefully stir in chicken broth, lime juice, salt, pepper, and rice. Cover and bring to a simmer. Allow to simmer for 5-7 minutes, or until most of the liquid is gone. Stir in spinach, grated Parmesan cheese, cilantro, and lime zest. Cover, remove from heat, and allow to stand for 5 minutes. Remove cover and fluff mixture with a fork. Serve with additional Parmesan cheese and cilantro, if desired. **I like to use a block of Parmesan and grate it with a Microplane for fresher cheese than the bagged, shredded Parmesan. The freshly grated cheese also melts more evenly in this dish. The Microplane also works great to zest your limes! We are definitely all over the place weather wise too! I go back and forth between wanting comfort foods and lighter spring stuff! This skillet sounds delicious!! Our weather is crazy with downpours of rain and breaks of sunshine, but at least there’s some sun! I love cilantro lime rice so much and turning it into a skillet meal was such a great idea! Wow, this looks sooo flavorful and delicious. Definitely perfect for the start of Spring, even though it’s raining here today 🙁 still, I wish I was digging into this for lunch! Easy, flavorful weekenight dinner perfection! I’m all about easy meals that don’t take too many dishes. The fewer I have to wash the better :). This looks fantastic! I love cilantro and lime, so much extra flavor. I wish the 50 degree weather was here to stay! Oh well, what can ya do? 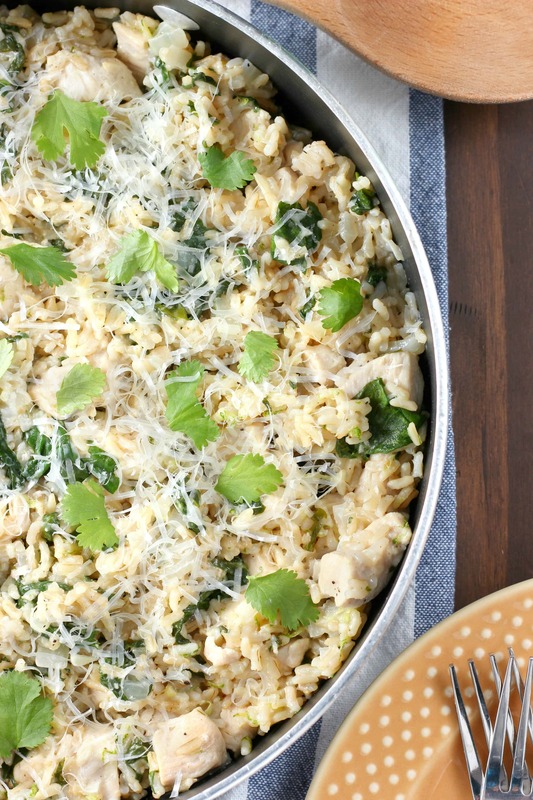 This skillet looks delicious….love that it’s ready in 30 minutes! We’ve been having wonky weather lately too! I’m definitely ready for spring weather to stay and this yummy rice skillet! Love the cilantro lime combo! Oh what a perfect spring meal, Jessica! I love this colorful skillet and those flavors. My kind of dish! This weather is driving me BONKERS!! But this looks fabulous! This looks so packed with flavor! I’m ALWAYS up for a good one pot meal! Yay spriiiiing!!! This is perfect! I love cilantro and lime together and I can think of nothing else than I would want for dinner right now. YUM. The colors in this dish make it look so appetizing! I love this one pan recipe!! The cilantro and lime sound flavorful together. I made this tonight for dinner. It was a hit! We made burritos out of it. Thank you so much for posting this. I’m so glad you liked it! Love the idea of making burritos out of it!